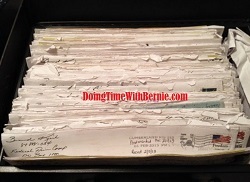 DoingTimeWithBernie.com: A Study in True Character, Respect and Honesty: Where's Felon Bernard Kerik? A Study in True Character, Respect and Honesty: Where's Felon Bernard Kerik? This week great, respected and trusted New York City crime and corruption leaders came together for a Reuters Live event on criminal justice, terrorism and other important matters in keeping peace: US Attorney Preet Bharara, Former NYPD Commissioner Ray Kelly and current NYPD Commissioner Bill Bratton. So, where was that NYPD Commissioner turned felon, criminal justice reformer and self-proclaimed "International Counter-Terrorism Expert", Bernard Kerik? Kerik chose to take another paid vacation by renowned charity, Central Texas Wolfpack Public Safety Football, to speak at their little barbeque in Austin. Of course, that would have been a bit awkward.... So how much did they pay you, Bernie Kerik? And how much will be going to your CRIMINAL RESTITUTION that is reportedly still UNPAID? Oh that's right...Does the "non-profit" money continue to allegedly funnel through your "non-profit" dark money ACCJR.org or that alleged shell company www.TheKerikGroup.com? Yes, Felon Bernard Kerik's assertion that having a building fall on you, saving only yourself, then making millions off the tragedy, makes one an "International Counter-Terrorism Expert" is laughable!